Cinco Puntos Press, 9781933693231, 64pp. Mr. Mendoza, Mexico's self-described king of graffiti, blesses the small town of Rosario with his sardonic wit. "Deflate your pomp or float away " he paints on the body of an unexpectedly exhumed monk. "No intelligent life for 100 kilometers," he proclaims on the sign that announces Rosario's boundaries. The residents of Rosario tolerate or enjoy Mr. Mendoza's commentary as best they can. But the town goes crazy when Mendoza announces--on the side of a pig--"Mendoza goes to heaven on Tuesday." Each new declaration from Mendoza drives speculation about his future. Suicide? Cancer? Syphillis? All the theories were in play until the Tuesday when Mendoza transformed his life with art. 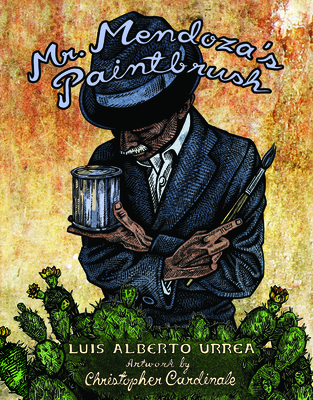 Mr. Mendoza's Paintbrush was originally written as a short story by Luis Alberto Urrea, a Pulitzer Prize finalist for The Devil's Highway and an Edgar Award winner for his short story "Amapola." It was published in 2002 as part of his collection Six Kinds of Sky. Artist Christopher Cardinale, whose graphic essays have appeared in the seminal magazines World War III and Punk Planet, adapted the short story to the graphic novel form. And critics are raving about the outcome. The Bloomsbury Review says, "Mr. Mendoza's Paintbrush is a rich gift, an off-center, enigmatic tale with a well-coupled balance of narration and art. Urrea and Cardinale are a 'match made in heaven.'" And Publishers Weekly adds that "this lovely comics adaptation...may have found the ideal way to present magical realism graphically." Luis Alberto Urrea is author of widely acclaimed novel The Hummingbird's Daughter and 2005 Pulitzer Prize finalist for nonfiction for The Devil's Highway. A member of the Latino Literature Hall of Fame, Luis was born in Tijuana, Mexico to a Mexican father and an American mother. This is his first graphic novel. Christopher Cardinale is a graphic novelist, muralist and community activist who lives in Brooklyn, New York. He is a regular contributor to the zine World War III.